Immerge Knowledge Labs Presents Immersion – India’s first international VR Film Festival and Conference – kicked off in style on 1st and 2nd March, 2019 at Mumbai’s Nehru Centre. Immersion has been imagined and conceived to be India’s most purposeful and credible IP platform in the field of VR & Immersive Technology. Immersive technology is impacting industries and revolutionising them including and not limited to gaming, wearables, education, tourism, healthcare, social change, engineering, entertainment and retail. Opening up to a packed house, Chaitanya Chunduri (Google-India Head AR/VR) set the ball rolling with a well-rounded take on the AR/VR story, and how Google products like ARCore and more will help build the ecosystem. Panel discussions on both days tackled topics and industry domains and how immersive technologies will play a role in shaping them or altering them. The second day was kicked off by key note speaker Nathan Gaydhani from SystemActive Digital based out of London. Nathan’s focus on enterprise in the operating space of Immersive Tech gave a lot for the founders, entrepreneurs and practitioners who were present. The Immersion Thinkfest featured speakers from across industry categories and domain experts in VR and immersive technology, including Chaitanya Chinchlikar (Whistling Woods – VP Business Dev), Vikramjit Roy (NFDC India-Chief), Arnav Neel (Ex MD, Blippar), Apul Nahata(Co-Founder Kalpanik VR), Pankaj Raut from NXG Dimension- Ajnalens to name a few. The areas of discussion were around future of education, use of XR in healthcare, gaming, cinema and entertainment and live sports and more. There were also break away sessions and workshops centred around coding a basic AR app, Cinematic VR, on the use of Substance in 3D modelling by Allegorithmic. The 200 plus XR enthusiasts and entrepreneurs, thought leaders and students, not only got to learn and attend all the knowledge sessions but also got to see the showcased films as part of the film festival. The VR Arena section was devoted to watching the films on head mounted devices and getting a truly immersive experience. Dell, Allegorithmic, Gamers Roof, Kiksar, Skybox Mediaworks and Dimension NXG also had stalls at the expo zone to interact with the attendees and give them a chance to use and test the latest wares in the AR/VR space. 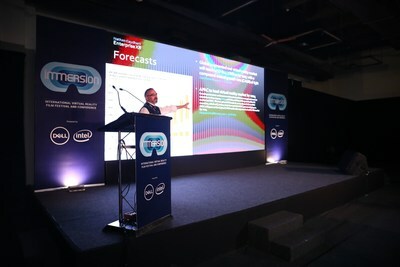 With over 40 speakers, 20 plus sessions, and over 60 plus brands being represented there in some form, Immersion has made its mark to be the pioneering effort in the immersive technology space In India and will be the platform for the various stakeholders to come to share, learn and contribute to the immersive space. Immersion has been imagined, designed and produced by Immerge Knowledge Labs (a partnership between VR Storytellers and NYUCT Design Labs). Immerge Knowledge labs believes there are very interesting applications in industry, content & brand experience, empathy and social impact. ‘VR StoryTellers’ is a convergence of film-makers, directors, producers, musicians, techies & sound engineers who are Committed towards building India’s virtual reality ecosystem into a sustainable, profitable model that impacts and disrupts not just the Indian AR/VR/MR industry, but also globally. VR StoryTellers is the team behind India’s 1st Stereoscopic 360/VR Horror Short Film – CRACKLE. For more information, visit: http://www.vrstorytellers.in. NYUCT Design Labs is a multi-disciplinary house of Venture Design that designs and builds ventures, brands, innovations and IPs. With more than 180 years of pooled wisdom, deep domain expertise across strategy, design, technology, content, experience and integrated marketing, NYUCT Design Labs engages with client’s right from blue sky thinking to blueprinting to last mile execution. Immerge Knowledge Labs is a company devoted to building knowledge / thought capital and designing and creating IPs and forums for immersive technology. It endeavours to build these IPs, forums and platforms for policy advocacy, enterprise and investor advocacy and consumer experience of emergent technology. It has been formed by two partner firms, NYUCT Design Labs Pvt Ltd & Everydoghasitsdayfilms Pvt Ltd.
Immerge Knowledge Labs Pvt. Ltd.